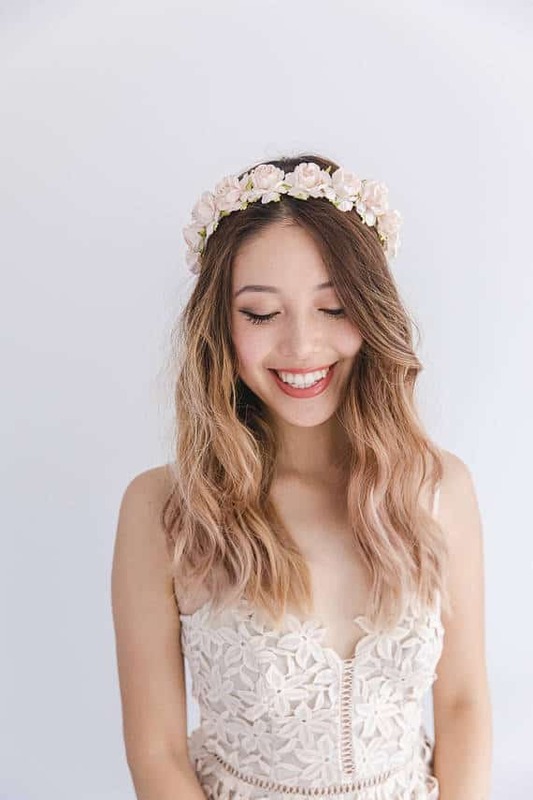 If you want to wear a floral accent in your hair on your wedding day, you can choose from flower crowns, floral combs, hairpins, and all sorts of floral headpieces. 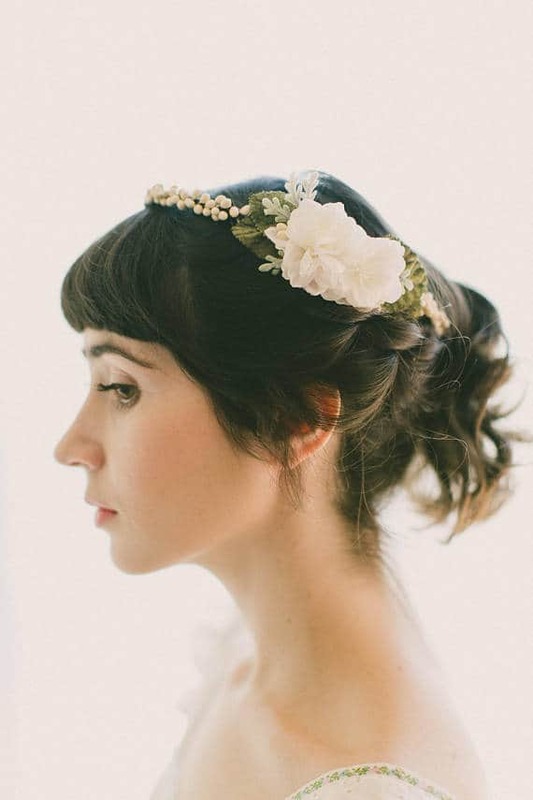 We’ve rounded up 20+ of our favorite flower crowns and floral hair accessories for weddings. 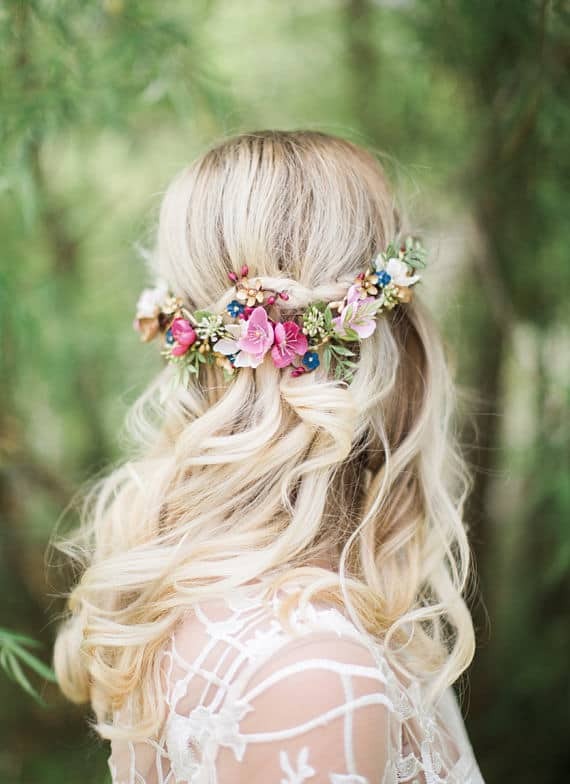 Is there anything more romantic than flowers in your wedding day hair? 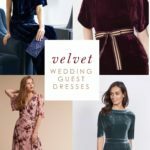 There are so many options for flower crowns and floral hair accessories for weddings, including silk flower and handmade wreaths! And, despite the name, they can be made of so many materials other than flowers! 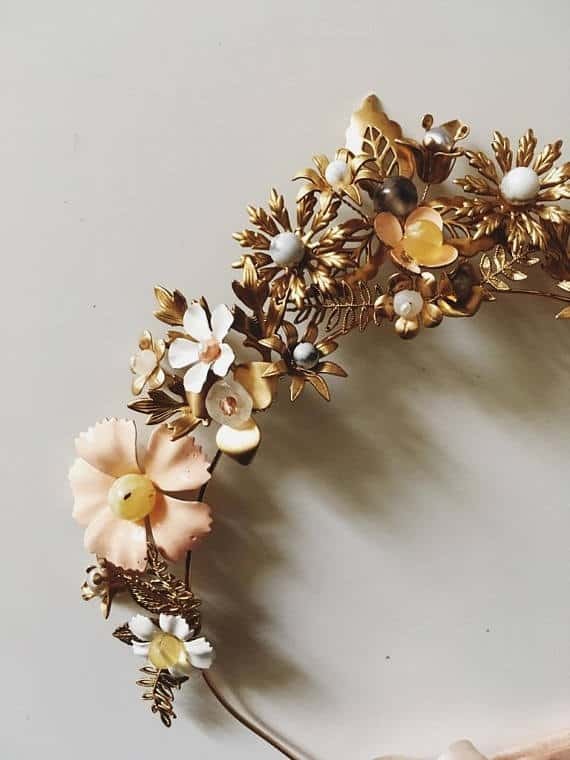 Just in this short round-up, we’ve found silk floral crowns, realistic floral combs made of porcelain and clay, natural dried flower crowns, and floral halos created from fine metals and crystal beads. 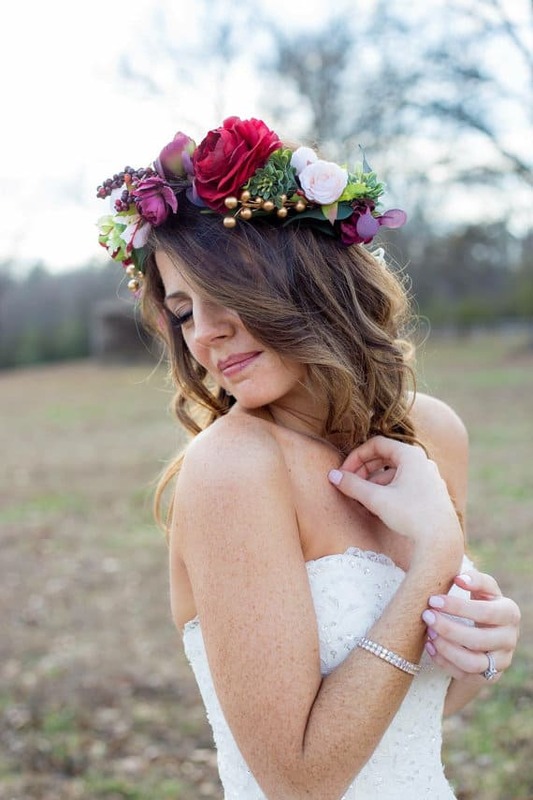 Even though the trend has been around for a bit, floral crowns are still hot headwear for weddings! 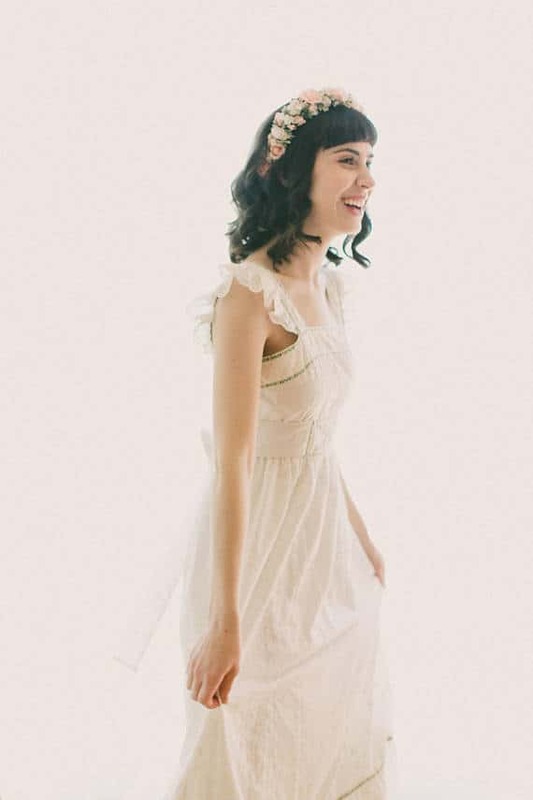 In fact, they are a classic style, since they have been used in weddings for decades, especially for flower girls! 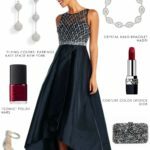 If you are considering this look, your florist can make you a beautiful and real floral crown, you may also opt for a silk or faux flower crown or flower hair comb, for various reasons. 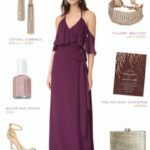 Here are a few of the prettiest examples we found, with details on how to purchase these pieces for yourself! 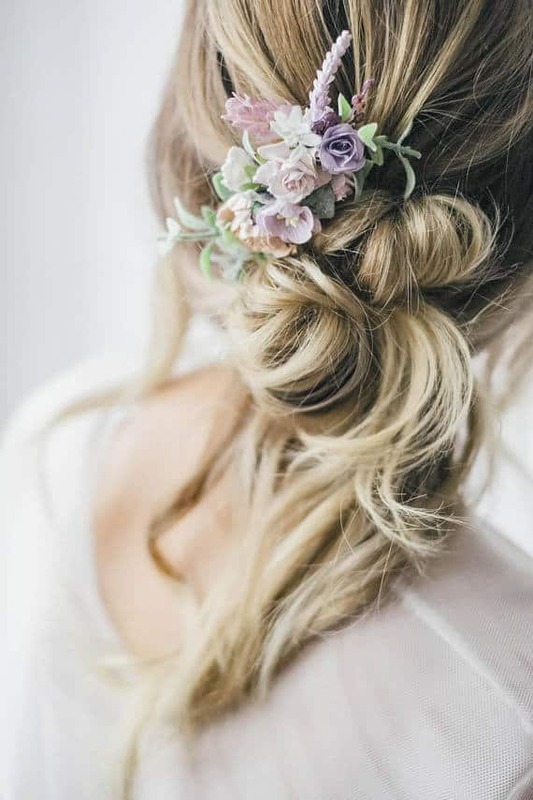 A flower crown always looks great on top of loose beachy waves, or ringing an updo, while a flower comb can nestle beautifully in a bun or braid. 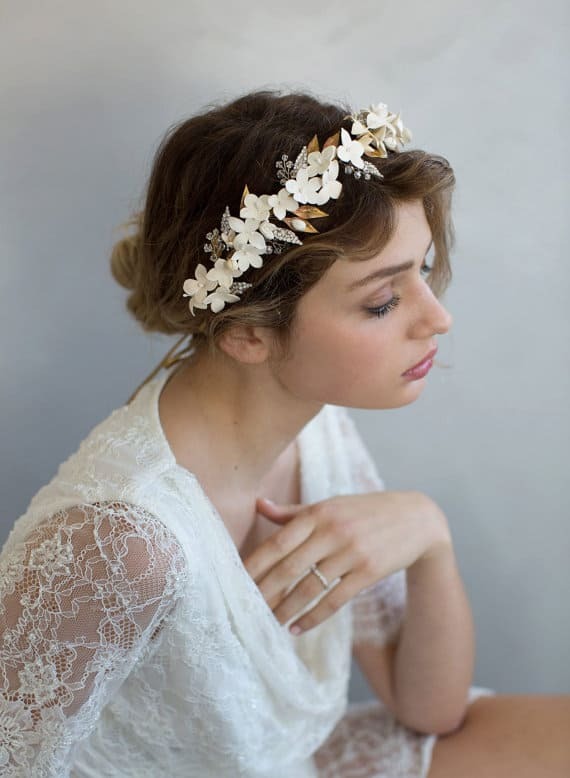 Floral crowns can be worn alone or atop a dropped veil. 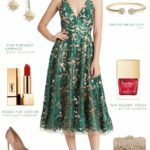 How to Decide: Faux Florals or Real Flower Crowns? 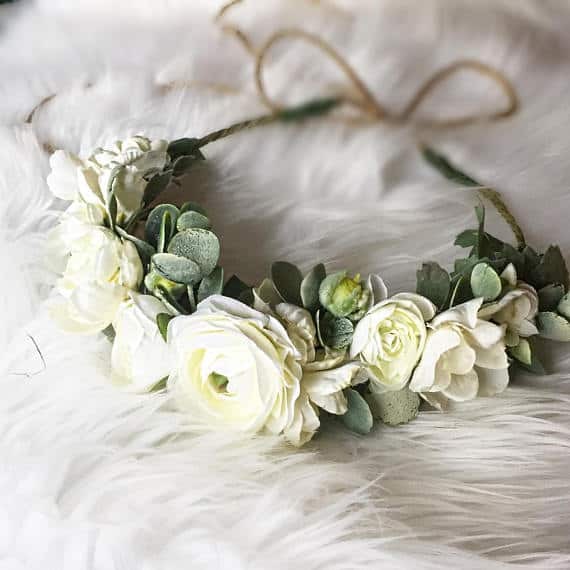 Real crowns are always beautiful, unique and fragrant. 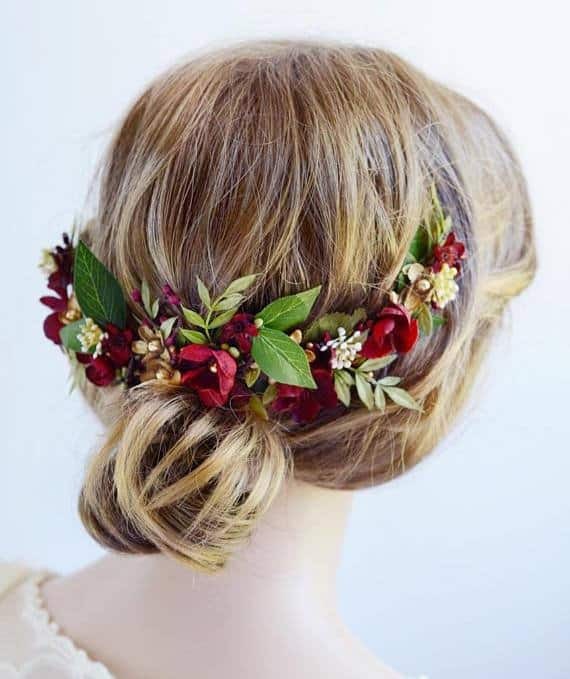 However, dried floral, silk flower, or faux crowns are sometimes just more cost-effective, not to mention more resilient and long-lasting. 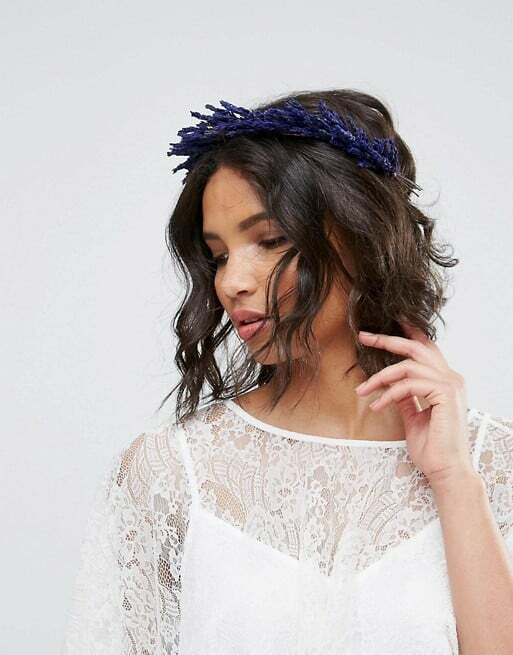 Another benefit of a faux floral headpiece, is that you can also purchase it well in advance to try out with your gown and hairstyle! 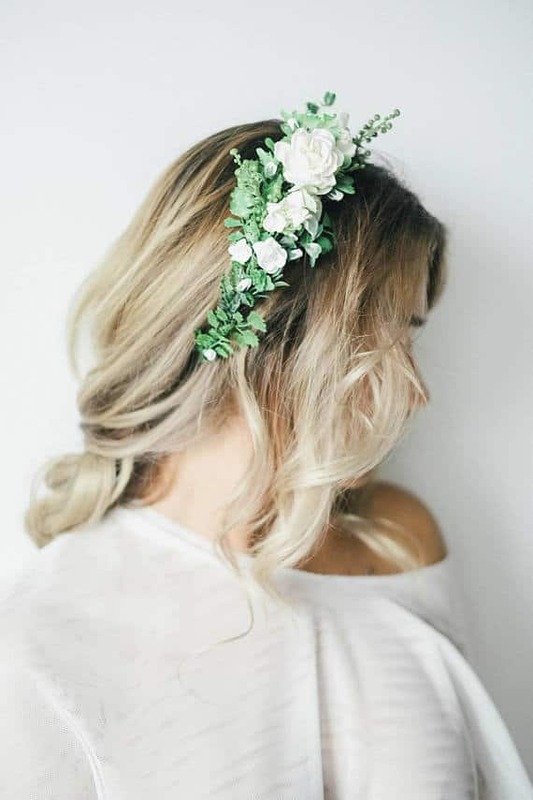 The durability of faux floral hair accessories is especially nice for playful flower girls or if you’ll be dancing or wearing the crown in hot summer temps. 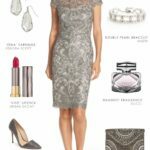 But in the end, the choice is yours – both real and faux are lovely! 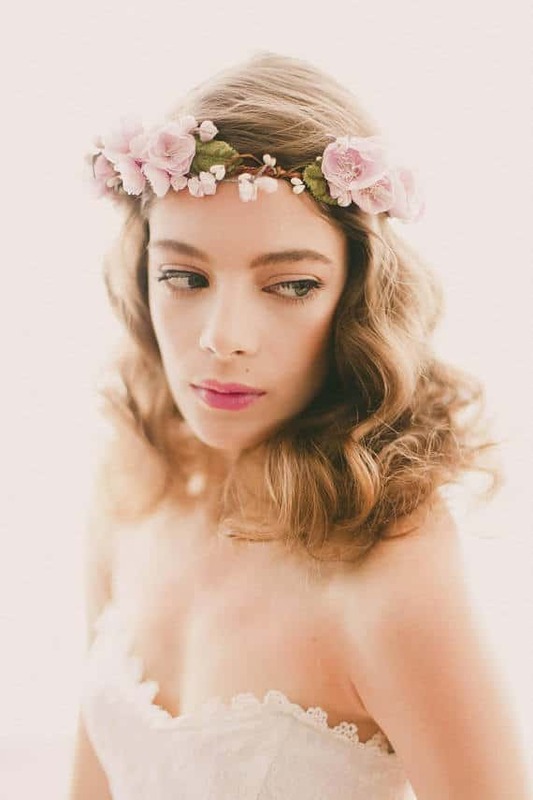 Bridal clay flower headpiece. 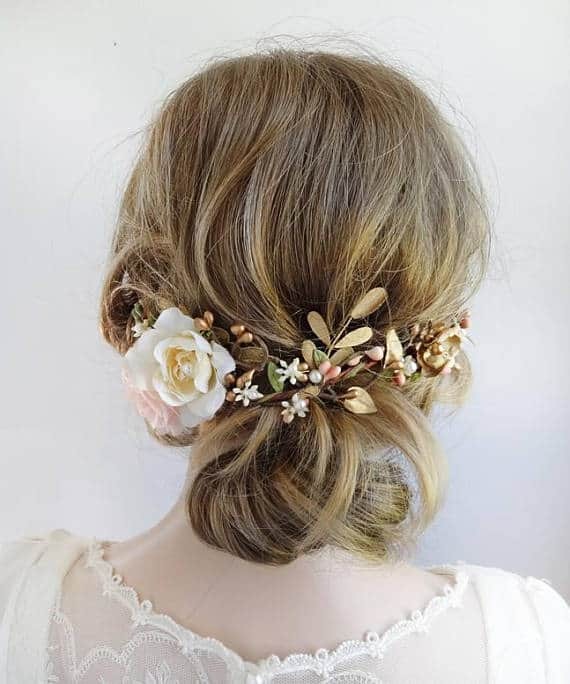 Simple sugar blossom hair vine by MyraKim on Etsy (Twigs & Honey) Photo by Elizabeth Messina. 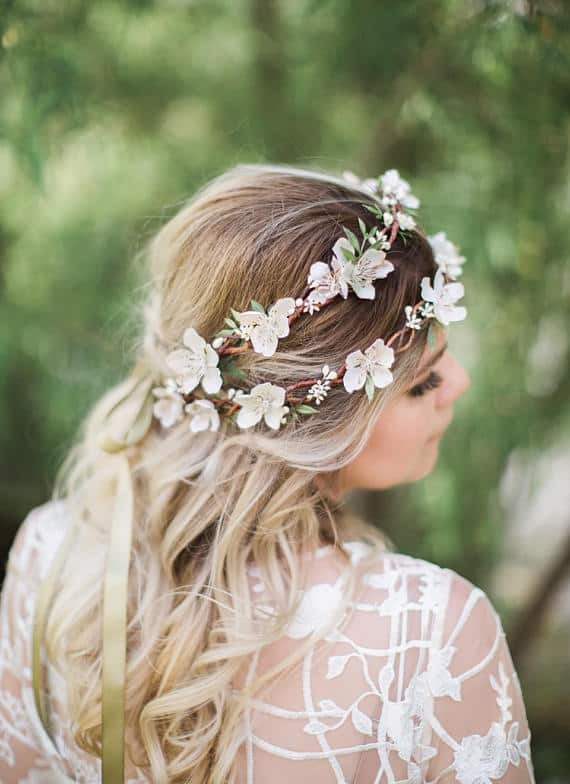 A wedding day isn’t the only day to wear a floral crown or flower hair accessory! 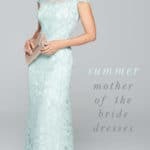 They are also beautiful accesssories for photo shoots, maternity photo sessions, mommy and me photos, and flower girls. 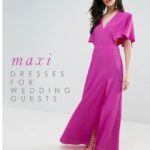 If you are planning on including your pets in the wedding, some shops will make floral wreaths for dogs and other pets, to florally outfit your furry friend for your wedding day! 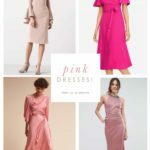 If you’re looking for your own personal styles, we found these These Etsy Sellers on our search. They all had some Beautiful Floral Crowns. 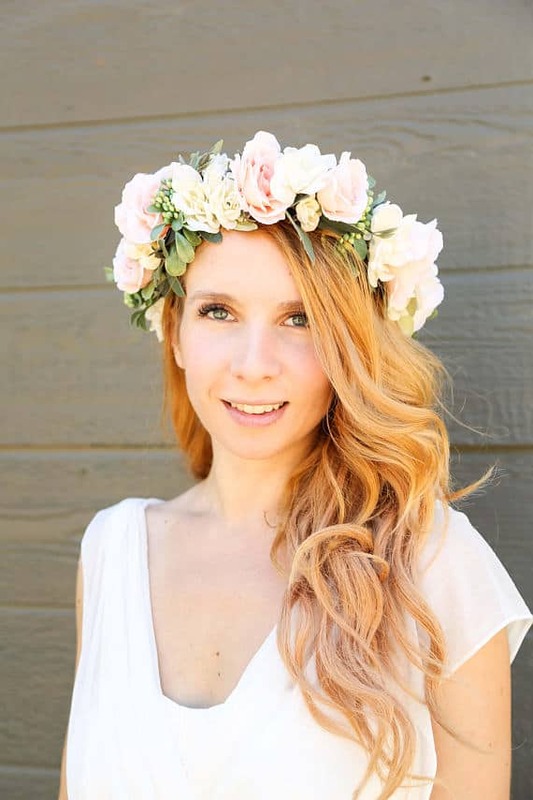 Ava’s Flower Crowns – Lots of styles for flower girls! Smorodinskaya – beautiful life-like floral creations made of fine porcelain! Mini works of art!